Next week (January 21st to 25th) is Healthy Eating Week in Scoil Niocláis. Throughout the week pupils will participate in many activities to promote healthy eating. Caoimhe O'Shea (dentist at Elmwood Medical Centre) will be visiting the school on Tuesday, Wednesday and Thursday mornings. During this time she will visit all classes to provide pupils with a brief talk about brushing, maintaining healthy teeth etc. She will also be giving a talk specifically for parents on Tuesday the 22nd of January at 9am to 9:30am in Naomh Bríd:16. All parents are welcome to attend. More news regarding Healthy Eating Week to follow! 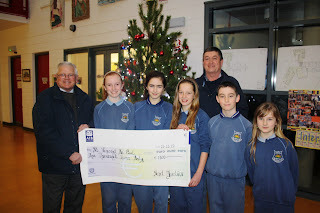 We proudly presented the proceeds of our Christmas Cake Sale to St. Vincent de Paul. Thanks to all thoe who worked hard in the kitchen to make this such a successful and enjoyable occasion!